The Greehey School of Business at St. Mary’s University will once again celebrate Business Week, in its 43rd edition, beginning Tuesday, Oct. 2. “Speakers will address a wide variety of topics that discuss how work and the skills required to perform this work will change over the next decade,” said Tanuja Singh, D.B.A., Dean of the Greehey School of Business. Opening this year’s Business Week is Peter John Holt, CEO and general manager of HOLT CAT, who will deliver the La Quinta Keynote Lecture, titled “Values Work,” from 9:45 to 11 a.m. on Tuesday, Oct. 2, in the Albert B. Alkek Business Building’s Atrium. 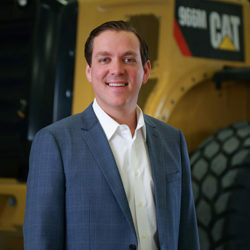 Holt, the great-great-grandson of Benjamin Holt — who introduced the first practical track-type tractor in 1904 — represents the fifth generation in his family’s business. He joined HOLT CAT in September 2011. Following Holt’s keynote lecture will be a presentation and workshop from Diane Flynn, co-founder and CEO of ReBoot Accel, a company that offers training and placement programs to help women acquire jobs. On Wednesday, Oct. 3, a host of lectures will be delivered by business professionals including Lynette Aguilar (B.B.A. ’03, M.B.A. ’05), assistant vice president for Call Center Operations for AT&T; Kate Fannin (B.B.A. ’95), executive director of marketing for The Estée Lauder Companies; James Garvin, Ph.D., CEO, president and director of CytoBioscience Inc.; and Angela Walch, J.D., Professor of Law at the St. Mary’s University School of Law. Thomas Horton, senior adviser for Warburg Pincus and former chairman and CEO of American Airlines, will speak to students, faculty and staff on Thursday, Oct. 4, from 9:45 to 11 a.m. in the Alkek Building’s Atrium, followed by the Meet-the-Firms Career Fair at 2 p.m. in the University Center’s Conference Room A, at which students will network with local, regional and national employers. “It is also a celebration of all that we have accomplished and a vison of all that we aspire to become,” she said. To view the full schedule of events, visit the Business Week webpage.